This is the highly anticipated third edition of the best-selling book which has become the definitive resource for understanding venture capital fundraising. Whether you are an entrepreneur, lawyer, student or just have an interest in the venture capital ecosystem, Venture Deals is for you. 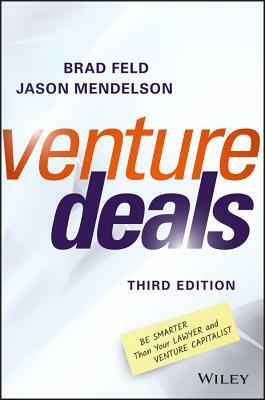 The book dives deeply into how deals are constructed, why certain terms matter (and others don't), and more importantly, what motivates venture capitalists to propose certain outcomes. You'll see the process of negotiating from the eyes of two seasoned venture capitalists who have over 40 years of investing experience as VCs, LPs, angels, and founders. They will teach you how to develop a fundraising strategy that will be a win for all parties involved. And as in the previous editions, this book isn't just a one-sided opinion from venture capitalists, but also has helpful commentary throughout from a veteran CEO who has raised many rounds of financing from many different investors. BRAD FELD has been an early-stage investor and entrepreneur for over twenty-five years. Prior to co-founding Foundry Group--a Boulder, Colorado-based venture capital firm--he co-founded Mobius Venture Capital. Brad also founded Intensity Ventures, a company that helped launch and operate software companies. Prior to this, Brad founded Feld Technologies. He is also a founder of Techstars and has been active with non-profit organizations, including acting as chairperson for the National Center for Women in Technology. JASON MENDELSON has 20 years of experience in the venture industry. Prior to co-founding Foundry Group, Jason was a Managing Director and Chief Administrative officer at Mobius Venture Capital, where he also served as the firm's general counsel. Besides his experience as a venture investor, Jason has also been a software engineer, startup lawyer, and a co-founder of SRS ] Acquiom. He is an adjunct at the University of Colorado Law School where he co-teaches a course on venture capital and entrepreneurship.